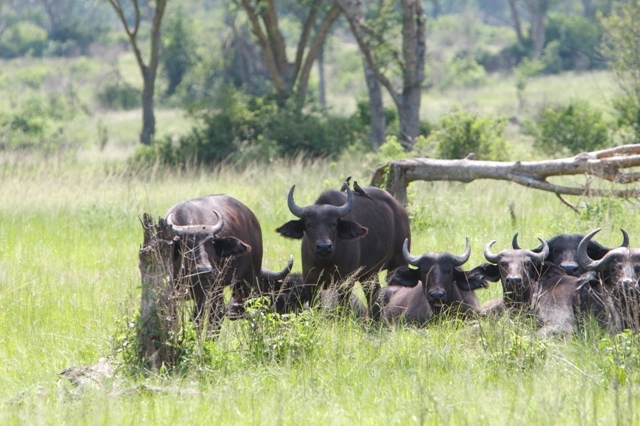 This tour is perfect for people who want to experience the real Uganda and immerse themselves in the local culture and natural wonders. You will visit almost all national parks in Uganda! Safari in almost all national parks! Depending on the time of your arrival, you might be able to explore Kampala. All activities today are at your own cost. Today you continue your journey by crossing to the west of the country to Murchison Falls National Park. You will game drive towards your lodge on the southern bank of the Nile. You will be staying at a great mid-range lodge, overlooking the River Nile. From here you can relax the rest of your day. Return to your comfortable lodge, to enjoy a good meal and enjoy the views. In the afternoon you will go for another game drive on the park, or you can decide to relax a bit at the lodge. Today you will begin your journey to Kibale Forest N.P. The drive is incredibly scenic, passing through tea plantations and the lush green countryside which characterizes so much of Uganda. After about seven hours’ driving, you stop for lunch in the cozy town Fort Portal (lunch is not inclusive). After lunch, you have time to walk around town, observe local life and/or visit the local market. Then you drive one more hour to the lodge. Spend the late afternoon relaxing and enjoy a lovely view of the forest and its wildlife. An experienced ranger will take you chimp tracking in the morning or afternoon; you might also see other monkey species that live here. Once you locate the chimpanzees you will have a full hour of eye-to-eye contact with them. Since they are wild animals, we can never guarantee you to see them and might have to settle with hearing their hoots and hollers. At an additional fee you can do the chimpanzee habituation tracking instead of the regular chimpanzee tracking. This will take all day and you will be 100% sure to have a very close enounter with your closest relatives. Book this in time because only 6 persons per day are allowed to go. Your swamp walk can be postponed to the next morning. In the late afternoon you will go for a game-drive into the park. And then the hotel of your choice. In the afternoon you will take a boat safari along the Kazinga Channel which joins Lake George and Lake Albert. After a relaxed breakfast you will proceed to the southern part of Queen Elizabeth National Park, to the so called Ishasha area. Ishahsa is home to the famous tree-climbing lions. While lion cubs around the world frequently climb trees for fun, adults rarely do. The adult lions in Ishasha are an exception to this. It is thought that they sit in the branches to get away from the tsetse flies and to enjoy a cool breeze. If you are lucky you might spot a few during your game drive! Your accommodation will be any of your choice, possibly one surrounded with acacia forest, lush vegetation with palm trees and scattered grasslands. Find birds, monkeys, and other wildlife around your cottage! Today you drive to Lake Mutanda in the south-western part of Uganda; close to the borders with Rwanda and Congo. You cross a beautiful part of the country often referred to as ‘the Switzerland of Africa’. You will see a great country-side, bamboo forest and have great views over the Virunga Mountains. For lunch you will stop at a local restaurant on the road (lunch is not inclusive). Today you can choose to unwind from your trip at this stunning location. You can as well opt for some wonderful optional activities from the lodge.The south-western part of Uganda is known as ”Little Switzerland” , a lush, mountainous region dotted with freshwater lakes, which makes it the perfect base for a number of activities beyond gorilla tracking. The area is great for walking, hiking, mountain biking, cultural village tours, bird watching or water sport activities. When you are interrested in tribes/ culture you should not miss this: A new tourism trail, result of a collaboration between the Uganda Wildlife Authority and the United Organisation for Batwa Development in Uganda, is helping the indigenous Batwa pygmy people to keep their culture alive, following their eviction from the forests of southwest Uganda more than two decades ago. The Batwa are Uganda’s traditionally forest-dwelling pygmy people. About a century ago, there was a conflict between the Batwa and the Bantu speaking people in the region. The Bantu tried to expel the Batwa people from the area, so they hideout in Garama Cave. The Bantu had no idea there was a hidden cave in the forest and therefore could not find the crafty Batwa. Your guide will explain how the Batwa lived and fought out of this cave. The cave is 342 meters in length and 14 meters deep, and is now only inhabited by bats, The walk to and from the cave passes through mountain woodland with plenty of opportunity to enjoy the scenery or watch birds ($85,- pp, including Mgahinga NP fee). After breakfast, you will travel to Lake Mburo National Park, one of Uganda’s smallest parks, but certainly not to be underestimated. It is the only Ugandan national park (besides to Kidepo Valley N.P.) which is home to zebras, elands and impalas, as well as to an abundance of other wildlife – not to mention the lake itself, which is teeming with hippos and crocodiles! Last but not least. Tonight you will rest at the accommodation of your choice. After brunch at the lodge, you will drive back to Kampala or Entebbe (Airport) stopping at the equator for the requisite snapshot and a bit of souvenir shopping. Accommodation for tonight is not inclusive in the itinerary. If you wish to depart tonight from Entebbe Airport, make sure your flight is at 10 pm or later. If you want us to book one (or more) nights in Kampala and/or Entebbe, please let us know. Our standard offering for mid-range tours is a 4wd minibus with pop-up roof for easy safari viewing. All passengers will have a dedicated window seat. Your professional and courteous driver/guide will be at your disposal for questions or translations. There is, of course, an open roof for an excellent safari view. The extended landcruiser is suitable for a maximum of 7 persons.